read the very familiar parable with fresh eyes. BEGIN THE ENCOUNTER>Meaning and Application>Encountering the Text (all sections). insight you gained from your reading. 3) Study the painting by James Janknegt and my analysis of it on ProdigalsAll.com ~ BEGIN THE ENCOUNTER> Artistic Impact>The Prodigal Son in Painting>Janknegt 2002 and Janknegt Interpretation. reflection of approximately 200-250 words based directly on some aspect of this painting. Context>Gospels>Luke 9-19 and Luke 15 and Epistles>Philemon and Romans. and Psalm 23 and Jonah. reflection of approximately 200-250 words based directly on one insight you gained from your reading. Artistic Impact>The Prodigal Son in Painting>Quist 1975. 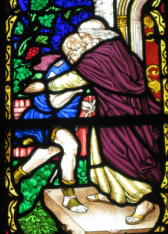 1) Read about the Cultural Context of the Prodigal Son in Kenneth Bailey, The Cross and the Prodigal. and Application>Encountering the Cultural Context>Cultural Questions and Cultural Answers for each section. Impact>The Prodigal Son in Painting>Riojas 2000s and Riojas Interpretation. ENCOUNTER>Meaning and Application>Encountering the Theological Meaning>Theological Meaning>God. Impact>The Prodigal Son in Painting>Slevogt 1899. ENCOUNTER>Artistic Impact>The Prodigal Son in Painting>Rembrandt 1668. Encountering the Theological Meaning>Nouwen Return. personal reflection of approximately 200-250 words based directly on some aspect of your reading. Reading Guide to direct your reflections on your reading experience. characters in the novel are like and unlike the characters in the parable of the Prodigal Son. Impact>The Prodigal Son in Fiction>. Use the Reading guides on the website to direct your reading and reflection. Prodigal Son in Music ~ and any others that you may discover. BEGIN THE ENCOUNTER>Artistic Impact>The Prodigal Son in Music>Britten. personal reflection of approximately 200-250 words based directly on some aspect of one piece of music. ENCOUNTER>Artistic Impact>The Prodigal Son in Painting>Tissot 1880.
personal reflection of approximately 200-250 words based directly on some aspect of this painting. Impact>The Prodigal Son in Film/Drama>. ENCOUNTER>Artistic Impact>The Prodigal Son in Painting>He Qi 1996. ENCOUNTER>Artistic Impact>The Prodigal Son in Painting>Palma 1595.
scene, and do an internet search for any paintings that interest you. Compose a sermon, an essay, a series of lessons, a set of poems, a short story, a play, or a film script or produce a musical composition, a painting, a video, or any other creative expression through which you gather up and communicate some of the insights you have gained by your encounter with the parable of the prodigal son.